This mojo sauce is typical of the Canary Islands, the Spanish islands located just off the northwest coast of Africa. These islands were the first stop for ships returning from the Americas, so many new foods and spices were incorporated into their traditional Spanish cuisine. Mojo sauces are commonly eaten with grilled meats and fish, as well as boiled potatoes. Simple to make, this mojo is made by blending fresh cilantro, garlic, cumin, olive oil and vinegar. It’s the perfect sauce for summer barbecues. Serve with potatoes, meat or fish. Peel the garlic cloves. Trim stems from the cilantro bunch. 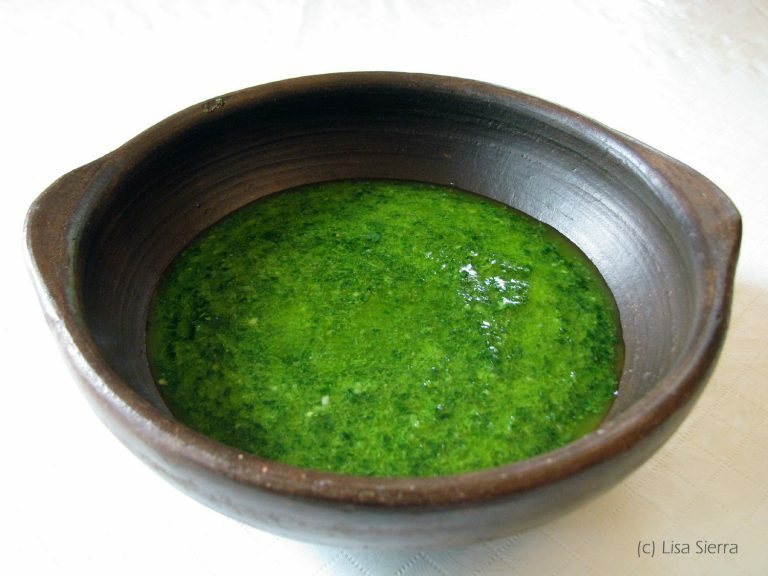 Process the cumin, garlic, cilantro and salt in a food processor or blender to create a paste. While blending, drizzle in olive oil gradually. Add small amounts of water until the sauce is thick, but not as thick as a paste. Add 1-2 tsp vinegar or more, according to your taste. If you will not use the sauce the same day, store in a glass jar, (such as the jars made for canning). Seal tightly and refrigerate.